Wow! OK, I'm back from my kid's field trip (nature center; they learned about how animals handle the winter via hibernation, migration & adaptation...learned about fossils...went on the nature trail to look for animal tracks...and even dissected owl pellets, hooray!!). Of all the days to miss a major HHS/CMS conference call, this was a big one. I'm furiously poring over the HHS Dept's ASPE January Enrollment Report which, as I expected this morning, was just released less than two hours ago. There's a lot to absorb here, and I missed the conference call from around an hour ago, so there may be additional details/key points which I'm unaware of, but the report itself is very detailed (in fact, they've broken it into two separate reports this time; the first one covers the overall national data, the second breaks down the individual state-level data). In addition, there are two major changes from the first ASPE report from last year. 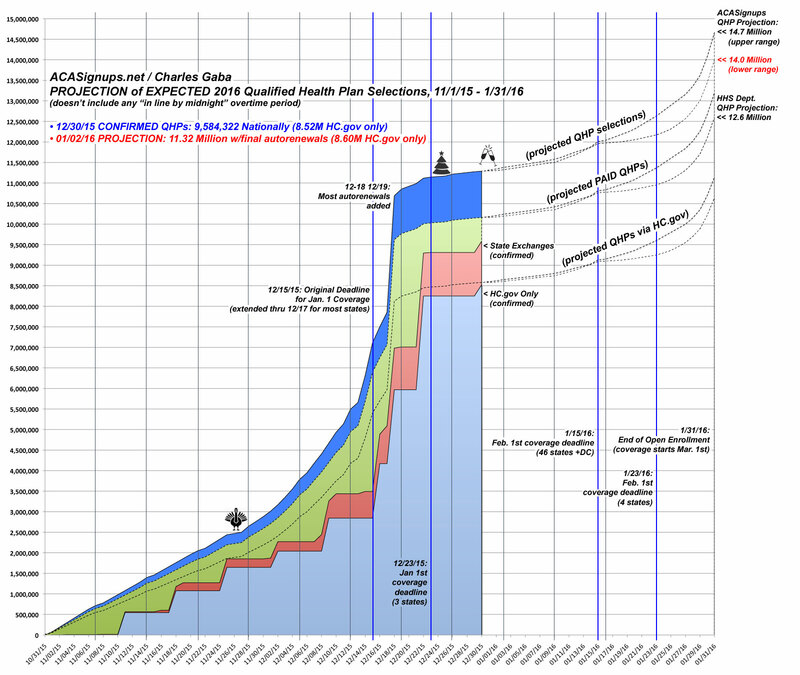 Last time around, the report only covered one month (11/15/14 - 12/15/14), and didn't include auto-renewals on the federal exchange, which meant that it only included around 4 million QHP selections even though the actual number was up to around 8.8 million as the end of 2014. I was expecting something similar this year--in fact, I figured that only November (11/1/15 - 11/30/15) would be included, which would have made the report somewhat useless for my purposes (aside from perhaps some partial data form the "radio silent" states of New York, Kentucky, Vermont and DC). HOWEVER, it turns out I was dead wrong about all of this, and I couldn't be happier: Not only does this year's ASPE report include auto-renewals for every state, it runs all the way through December 26th, 2015 (in fact, the footnotes say that California and Massachusetts data runs through 12/27 and 12/28 respectively, which is kind of odd but whatever). In other words, everything should be included for every state up through just 12 days ago, which is about as comprehensive as I could ask for. My own numbers are still going to be slightly higher for most states, however, since the 12/27 - 1/02 Weekly Snapshot report was also released yesterday; I also have post-12/26 numbers from Maryland (12/28), Minnesota (12/28), Colorado (12/31), Rhode Island (1/02) and Washington State (1/02). In addition, as always, the ASPE report is chock full of all sorts of additional data geek demographic goodies: Breakdowns by metal level, age bracket, income level, gender, ethnicity, renewals vs. new additions and so on. OK, so first up is this: As I've been noting for a couple of weeks, I had projected the grand total nationally to hit 11.32 million as of 01/02/16. According to the actual ASPE report, the grand total as of 12/26/15 was 11,258,183. If you tack on the 83,297 which was added to the HC.gov states between 12/27 - 01/02, you're at 11,341,480 as of 1/02/16. ...and you're up to at least 11.37 million as of January 2nd. In fact, it's a bit higher yet, since there's still a week's worth of numbers missing from California, Connecticut, DC, Idaho, Kentucky, Massachusetts, New York and Vermont. I'm assuming around 20K or so, which would bring the grand total up to roughly 11.39 million. Again, these numbers are gonna bounce around slightly, but it looks like I'm within 0.5% of the exact number. UPDATE: OK, I've plugged the most up-to-date numbers into the spreadsheet, and sure enough, the confirmed total now stands at 11,368,531. Most states are as of 1/02; Connecticut, DC, Idaho, Kentucky, New York and Vermont are all thru 12/26, California is thru 12/27, Maryland, Massachusetts & Minnesota are thru 12/28 and Colorado is thru 12/31. SACRAMENTO, Calif. — With less than one month remaining in this year’s open-enrollment period, Covered California announced Thursday that more than 238,000 new consumers had enrolled in health care coverage by the end of Jan. 2. Covered California also announced that more than 124,000 new and renewing consumers had enrolled in the new optional family dental coverage. Setting aside the dental plan news (which is nice as well), let's look at the 238K new enrollee figure as of Jan. 2nd. The ASPE report gives California's total as of 12/27 as exactly 1,411,664 people, of which 16% are new. 16% of 1,411,664 = 225,866. Round that up to 226K, and it means that CoveredCA added 12,000 more between 12/28 - 01/02, for a total of around 1,424,000 as of January 2nd. Add that 12K to the national total and you're up to 11.380,531 as of 1/02/16.